Canada’s big squad took on the undermanned Finland on the Western Oval. The conditions were fine with a light breeze across the ground, ironically it was a southerly but it would be the Northwind that would dominate the day. The Finns who started with a small squad on paper have lost one of those to a broken leg and had others withdraw prior to the first game. This saw them with little in reserve to what they could put on the field. From the first bounce Canada came out strong and dominated the center clearances. They got the ball forward well but the Ice Breakers defence spoiled continually and captain Freddy Romar led the way. The Canadians were forced wide and put under pressure and they missed a lot of early shots before Murray Lovett finally broke through to score the first goal of the match for the Canadians. The Finns did not look at all out of place though, with good skills, linking up well with handball they looked like they may be able to get something started. But the experienced Canadians were relentless and finally broke through again through James Maitland who seemed to be running unmarked off wing for his country’s second goal. The Canadians took a 21 point lead into quarter time. Denmark’s return to the International Cup is welcomed by everybody, they were missed in 2005 and most observers saw this as a danger game for the highly fancied US team. They were the real unknown, would they have improved markedly in their absence? After the initial flurry reminiscent of grand final openings, the US dominated the early part of the quarter. Paul Duncan missed from a set shot. Shortly afterwards George Lakomy started what would be a great day for the Boston forward by goaling after nudging his opponent under the ball, the call could have gone against him but the umpire allowed the mark, and Lakomy played on to goal from close range. Denmark then showed some spark and the ball spent the next five minutes around their half forward line without further reward. The US rebounded and Duncan kicked another point. Dan Sarbarker for the Revolution then marked the kick in and after a quick pass to Justin Valley the US were two goals up. A well-drilled South African Lions team posted a comfortable win over IC debutants China at Royal Park this afternoon. The Red Demons were held scoreless in the match, whilst the Lions' running brigade combined to finish the game with 12 individual goal-kickers in a 20.26.146 final score line. South Africa are stronger, faster and more skillful than we last saw them in 2005, with players such as Motuba, Hlomela, Mbhalo, Sethibe and Phakedi moving the ball very well by hand and foot and Horn and Toy Prinsloo providing effective targets up forward. The Chinese for their part were gallant in defeat, with the majority of their team having only begun playing the game very recently. The 2008 Australian Football International Cup burst into life today at Melbourne's Royal Park. There was a festive mood in the air for Round 1, with three grounds set to go in dry conditions, almost touching on warm in the sun that often broke through the clouds. The NAB 150 Roadshow was on hand, a few bus-loads of school children were present, a handful of media reps, and music and commentary were playing. It would of course have been nice to see spectator numbers in their thousands, but clearly that will not be the case as long as matches are held on weekdays in Melbourne. There were big wins to the favourites in Ireland (over Sweden), the United States (over Denmark) and New Zealand (over Japan), and a solid win to PNG (over Nauru). Other winners were Canada (over Finland), South Africa (over China) and Samoa (over India). Full match reports will follow over the next 24 hours, but what have we learnt about the various nations so far? First up at 11am was Sweden taking on the might of Ireland. The Swedes slotted the first goal through good run and followed it up with some strong contests, suggesting they might be a handful at this tournament. That was where the tide turned, as the Irish Warriors stormed away to win by 78 points in an ominous display. At the same time the Kiwis were stamping their authority on the tournament, 89 point winners over a Japan outfit that was competitive around the ball but just couldn't penetrate. The third match for the early session had Canada destroy an undermanned Finland side by 124 points. The intention is to update these scores each quarter as the games progress. Match reports and images will follow later. All times are Australian Eastern Standard Time (AEST), which is +10 GMT. A cool day, creeping up towards 15 degrees Celsius, but fine. The MCG was alive and buzzing, like a spaceship with its night lights on. But last night the action was in the Olympic Room, with an international Olympics kind of feel. The Welcome to the International Cup 2008 brought together 16 nations, 700 guests including footballers in team track suits from the red of Canada, Japan and Denmark to the Green of South Africa, and the black of New Zealand. You could bottle the excitement as the players felt like running onto the MCG as some will do in the Grand Final on Saturday September 6th, when the two top teams will play for the Cup before an AFL finals match. Last weekend Papua New Guinea sounded an ominous warning with a solid win over Coolangatta on the Gold Coast by about 5 goals, before heading down to Melbourne. Although it was a friendly and even included some sharing of players, it's still a strong sign of how good this team could be. A key issue will be player management. A great benefit to the PNG program is the scholarship system with Queensland clubs. 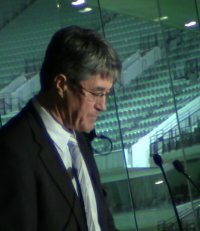 The downside from a national team perspective is that some players will return to play for their clubs during the Queensland finals, overlapping with the International Cup. AFLPNG's Scott Reid believes it's a worthwhile inconvenience, and is happy that they can manage it well, explaining the biggest group affected are their under 16 emergencies, so not really required for the International Cup. Several stars such as John James and Stanis Susuve will likely miss one of the pool matches for the same reason, as could some of the under 17s, but to be realistic, the Mozzies should still be able to defeat the far less experienced Peace Team in that contest. We are not going to wheel out the population statistics, or even the match stats, but China and India clashed yesterday at Ransford Oval in an International Cup warm up match. Official scores were not kept, but for those looking for a form-line on the tournament debutantes, China appeared to have edged out the Indians by a few goals. Media commitments meant that the captains of each team had to leave the match early. The Peace Team have won their practice match against the "Unity Team" by six points. 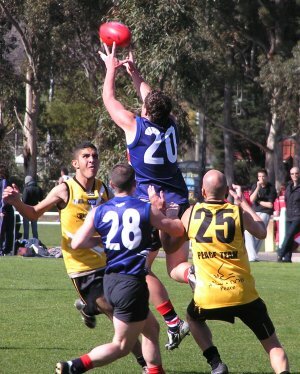 The game was held at Brighton Beach Oval last Sunday 24 August 2008. The Unity Team was comprised of footballers from Old Brighton Grammarians, AJAX Football Club and Melbourne's Islamic community. The Peace Team's first International Cup match is against Great Britain tomorrow. The game starts at 1pm at Royal Park (Ransford Oval). Onlookers will be keen to see if Kamal Abualthom can reproduce his stunning trial match form in which he booted 7 goals, reportedly from all angles and plays. 2008 is a special year for two Australian icons. Australian Football celebrates its 150th anniversary as does the National Bank of Australasia, a founder of today's National Australia Bank (NAB). NAB is celebrating the occasion with a road tour, "commemorating the people, places and events that have shaped our heritage and history. From 1858 to 2008 and beyond, this is the story of NAB and 150 years in our community." 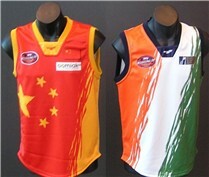 Over the next two days the NAB 150 Tour will celebrate Australia's own game of football and its spread around The World. Today the NAB 150 Tour joins the Samoan Kangaroos (supported by members from other International Cup squads) at St. Margaret's School (Berwick, Victoria) for a "Football-themed Day". Michael Roberts, Game Development Manager of AFL Samoa, has worked tirelessly to make the day special for students; with International Cup activities, special guests and Mascot Manor running footy clinics. On Wednesday, the NAB 150 Tour will join in AFL International Cup celebrations at Royal Park North in Parkville. Once again local school children will have the opportunity to take part in AFL clinics and visit the NAB 150 Tour Truck. From the NAB 150 Tour Website:The Australian Football Experience is an opportunity for football fans of all ages to learn about Australian Football history and participate in football activities. Come down and join AFL legends, Kevin Sheedy, Robert ‘Dipper’ DiPierdomenico, Nathan Buckley, Chris Grant, Luke Darcy and Neil Daniher, who will all be present to meet and greet their fans and take part in the day’s activities. Long time readers of worldfootynews.com may recall our good friends Jeff and Paul from the FootyWrap, a regular comedy segment that they uploaded to Youtube each week. Although long overdue, the guys have since made the step up to featuring prominently on the Herald Sun website. But true to their word they have still caught up with the International Cup, and the boost to its profile can't be underestimated. Read on for Jeff's exclusive thoughts on the tournament ahead and a direct link to their IC video on the Herald Sun website. After a three year wait since the last Australian Football International Cup, 16 teams converge on Melbourne's Royal Park tomorrow (Wednesday August 27th) for the first round of IC08. Here's a sneak peek at what to expect, and I'll stick my neck out to venture predictions, although admittedly some of the sides are yet to be seen in international action. The 16 sides have been seeded into 4 pools of 4, and in Round 1 some of the game's minnows face the power of more established footy nations. There are three times slots for the matches, with three games at 11:00am, three at 1:00pm and two at 3:00pm. Entry is free and the Melbourne public are encouraged to come down, pick their favourite team and help celebrate amateur Australian football from around the world.